PX Optical systems from $1,499 ! CX Camera systems from $2,699 ! 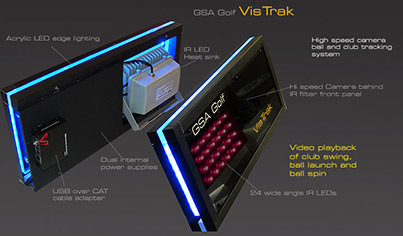 Stereoscopic ball tracking systems from $3,499 ! VisTrak systems from $1,499 ! Home/Studio track drape enclosures from $4,499 ! 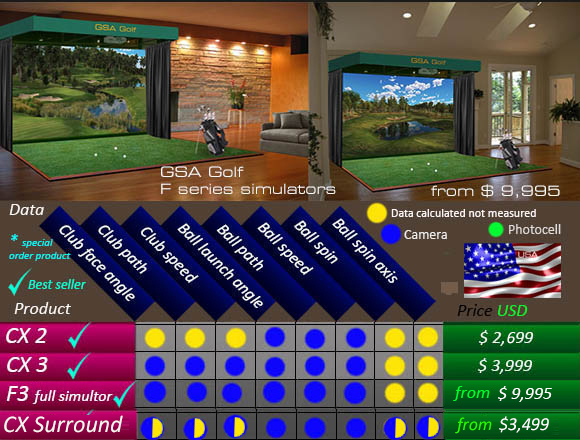 Tired of finding your ideal golf simulator on the Internet but only to find that the starting price is a crazy $49,000 ? Your problems are solved with our new F series state-of-the-art all camera based full system golf simulators. No other golf simulators on the market come even close to our F series even at 4 times the price ! 2. Choose between full camera systems, optical sensor systems or a combination of both. 4. All GSA Golf systems are completely modular - start with just 1 camera or sensor mat and add more cameras and features as and when requirement or budget allows. 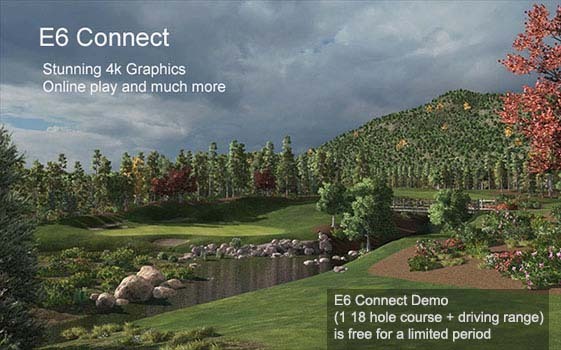 including the world's ultimate and by far the best golf simulation software on market with E6, TGC, Perfect Parallel and RedChain. 6.Tracks all important club and ball data including ball launch angle, azimuth, spin and speed. Club tracking data includes club speed, face angle at impact to ball, club path. 7.All data can be verified with real photographic evidence after each shot ! 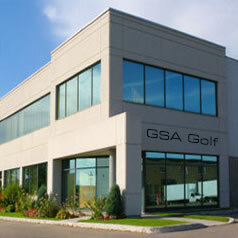 Note that this feature is unique to only GSA Golf systems. 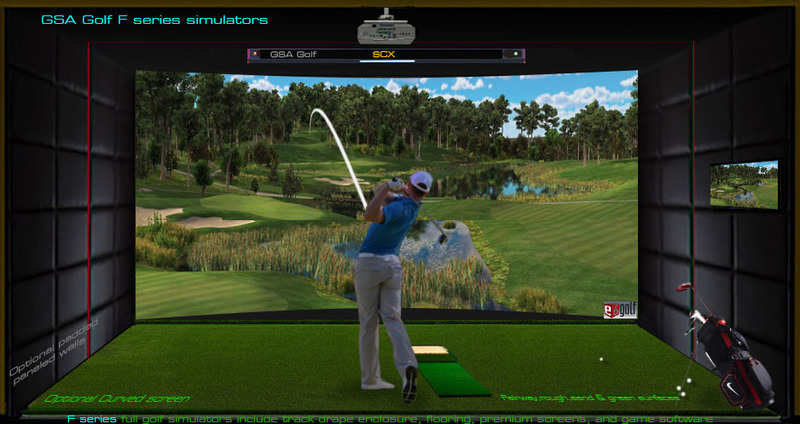 No other golf simulators on the market can provide this. 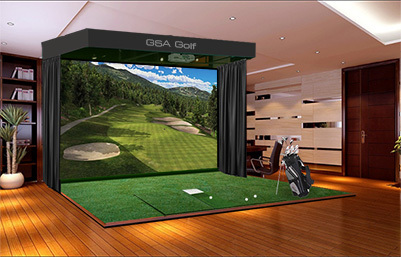 With all other golf simulator systems on the market, the player is forced to take the manufacturer's word that the data captured is correct. There is no way for the player to verify that their measurements are in anyway correct. 9. In contrast to radar based systems, all shots from 2 foot putts to 200 mph drives are detected. Note that radar systems are notoriously bad in detecting low shots and rolling balls when putting as these shots are literally under the radar. In fact putting is not even possible on most radar systems. Note that Radar systems emit electromagnetic micro waves that are so strong that they can detect a ball trajectory well over 400 yards away. And all those waves are going straight through your body too. reflect back to the radar receiver at the launch position. So you can multiply the power to do that by a thousand. the Bismark but who wants that in their living room? 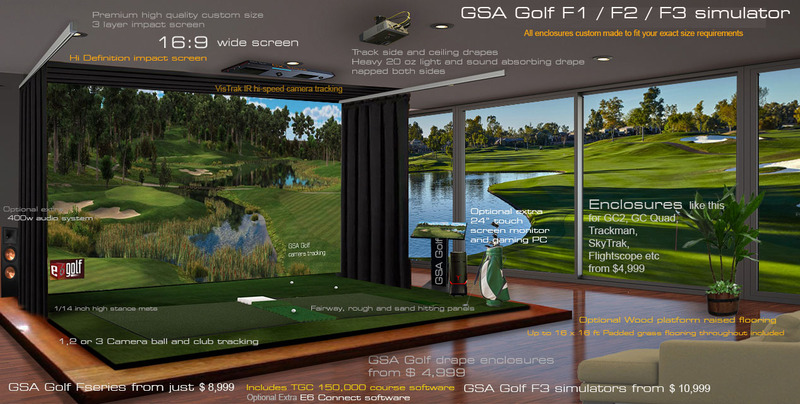 GSA Golf full playable systems with the world's best software start at just $1,499 ! then please shop around and let us know if you find one - we searched high and low and couldn't find one. Thinking of purchasing a hi-end launch monitor? you can get 2 of our F3 simulators complete with high end enclosures with beamers and full game software! 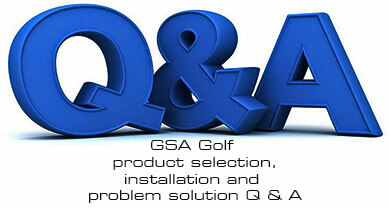 Why GSA Golf products are so inexpensive compared to others? Actually you should be asking "why are the others so expensive" ? There's no sound reason in our minds why golf simulators should be costing upwards of $30,000 to $95,000 ! These prices are - in our and many others opinions at least - grossly and outlandishly overpriced and the potential buyer should be aware of this. 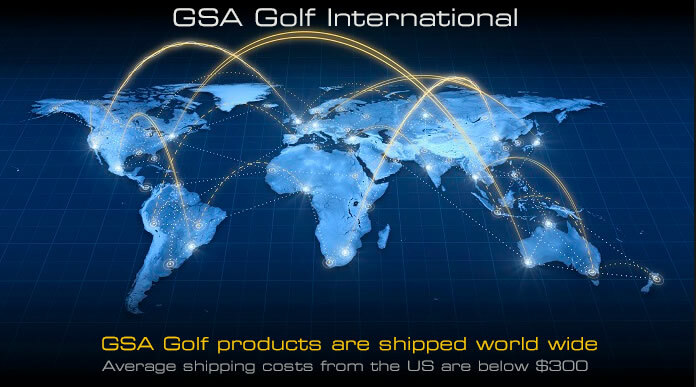 Due to the lower price, are you getting an inferior product with GSA Golf? and we operate ourselves on very lean and small margins. Note that we only use the best market leading software - as used by the super high-end golf simulators - so you won't see any difference between our systems and theirs. 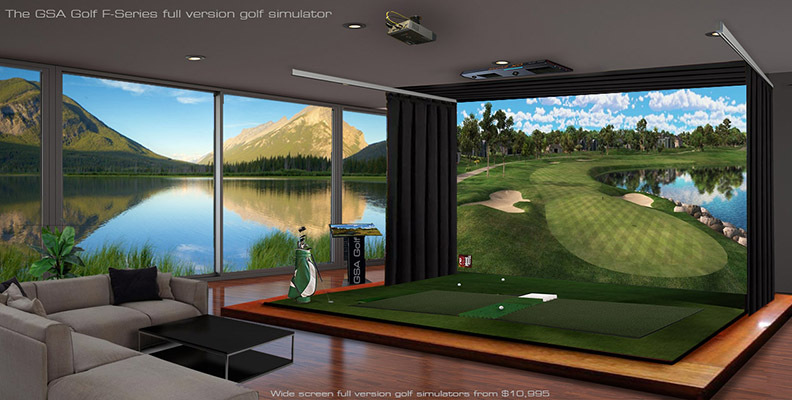 Already have a golf simulator but with outdated ball and club tracking? 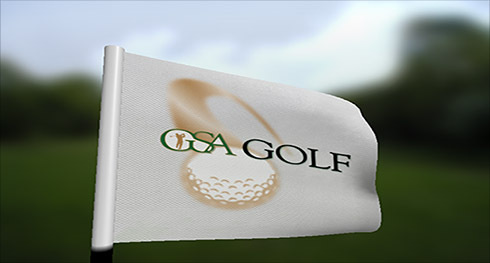 © GSA Golf Advanced Golf Simulators LLC. Naples, Florida, USA. All Rights Reserved.